We offer these sheets of currency, which are still connected as they were when they came off of the printing press. Certainly an unusual item to display or hang. 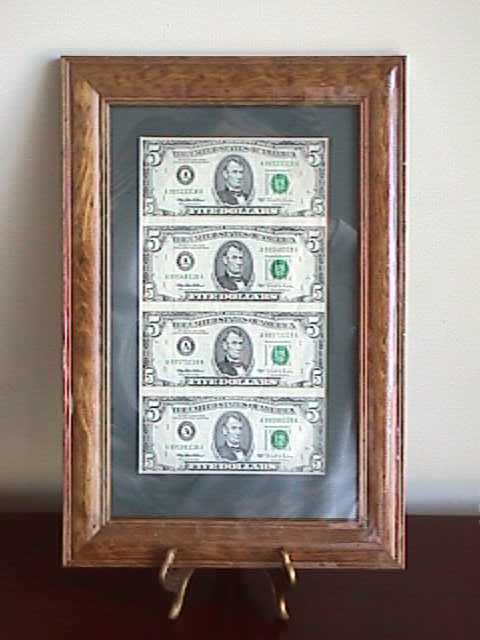 You may purchase with or without the frame shown. Feel free to cut them! 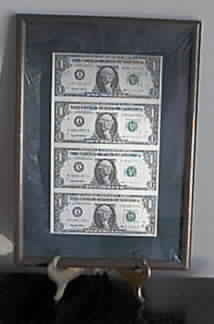 Uncut Currency Sheets _ Older Currency below these. Shown - Full sheet of 32 & 16 notes, shipped in cardboard tube. Available as 16 & 32 for the $2 and $5 note. Can be had for the $10, $50, and $100 also. Call/email for prices for those. 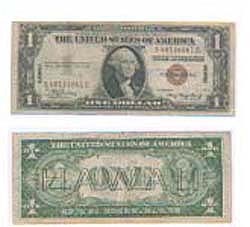 These emergency notes were issued during the war after Pearl Harbor was attacked. Neat piece of history that you should own. 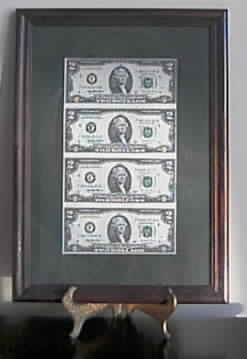 $1.00 1923 Large "Horse Blanket"
$1.00 1899 Large "Black Eagle"
$1 x 4 notes are no longer being printed. 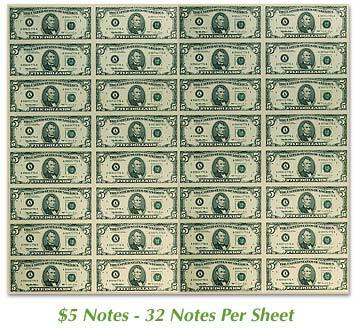 They are now $1 x 5 notes per sheet. When my 4 note sheets sell out, I will stock the 5 note. If you want a 5 note, email me for price. There may be a shipping delay of a few days to a week on some of these sheets. If framed items are not in stock, they will be delayed for framing. $5.00 notes are no longer being made. When these are gone, that is it.